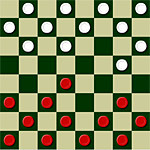 3 variants of the game of checkers: normal, poddavki and extreme. Choose what you want ..
Well if you know the flags of different countries? You can find among the six flags of the flag of Paraguay or Tuvalu? Check yourself in this game! Note: this is not so simple! The game is in English. This game is intended to show that you're not an idiot. However, you need to know a little English, and understand that they write, because if you write "You Fool", your pride will be very offended. The next test for people who want to appear not complete idiots. On the first attempt to pass failed. The game is similar to memorinu, but there are two differences: 1) All images are open 2) to vzaimounichtozhit the same image, you need to empty space could hold one (or more) lines at an angle of 90 degrees between the same images. You need to germinate tree so that branches fall into the ring. At the bottom of the screen shows how and how many times you can germinate a tree. Interesting logic game. The aim - of many to put down the pyramid of cubes. How to do it, you can learn from the instructions. In this game you need to try to light all the stars at the same time one charge. The system is as follows: if the fall of one star, it will "spit out" the charge of a left and right by lighting all the stars. Number of lives - is unlimited, but remember: you have one try. Remakes famous puzzle of the three wells. 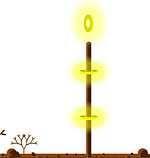 In this game you need to bring the electricity, gas and water to the three house so that the connecting lines do not intersect with each other. Everyone who loves memoriny, will mark this game. In the figures of different colors, some disappear after a moment, try to Guess the color or number disappeared figures. It is difficult to neprivychki. However, relax for 15-20 minutes ..
On top of falling objects which have to hang on the arm. The goal of the game - so place the objects, so that no one subject is not dealt with pleschuschey bottom water. logic game in which you must fill in cells with figures which are drawn on the blackboard. 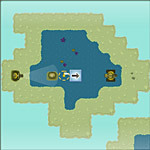 Controls: mouse-click on the cube with the figures (on the edge of the board). The game is quite difficult, but passable ..
Make every delicious dishes to get to scuba! Click on the gear, or conveyor .. 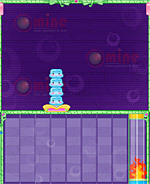 In this game you will be held tanchik white flag, using the Teleports and other devices, which need to be placed on the field before the start of movement.